Evaporative cooling systems have become increasingly popular in recent years because of their lower running cost and naturally created fresher air. These systems are suitable for use in areas where there is less heat and humidity in the home and workplace. An evaporative system absorbs the ambient heat, lowering the temperature and then adding a cool breeze feel indoors. Choosing the right size for your property is vital, so let’s delve a little deeper and examine the issues involved. How Does an Evaporative Cooling System Work? An evaporative cooling system pumps hot, dry air into the home to supply the air flow. This untreated air is passed through a series of pads that are soaked in water. This interaction creates evaporation and consequently the temperature is then lowered. The air is then treated and cooler, this is then pumped into the home via a system of ducts and fans. The treated air is then distributed throughout the property as required. The evaporative process ensures that the fresh air is not reused, which makes this a great option for people that have respiratory problems or allergic reactions. As we have previously mentioned, the air is 100% fresh making this a health option. The levels of moisture in the air will not dry out your nose, eyes, and skin or cause other irritations. The air is filtered and also chilled as it comes into your home so there will be no impurities to be concerned about. Unlike a traditional AC system, you can leave your windows and doors open during cooling which gives you a natural cooling experience. What Size of Evaporative System Will You Need? There are three major aspects that you will need to consider when choosing the right size of evaporative cooling system for your office or home. Every AC system needs to be sized correctly to the space where it will be used, and evaporative systems are no exception. This needs to be carried out by a professional to ensure that you get the size that will give you adequate performance and maximise energy efficiency. It may be tempting to choose the cheapest system, but this is not the best way to choose your cooling system. A quality unit will have more useful features, quieter operation and it’s usually a more energy efficient choice. An evaporative cooling system is a far more energy efficient than a traditional AC system. However, additional saving can be made if you choose the right system for your property. Look for a system that has an inverter, and you could reduce your energy usage by almost 50% in some cases. If they need ducted evaporative air conditioning, Perth residents and landlords should contact us here at Gas&Air. We can supply, install and service a diverse variety of heating and cooling equipment, including ducted evaporative air conditioning system. We are your local air conditioning expert, with extensive experience in both domestic and commercial applications. 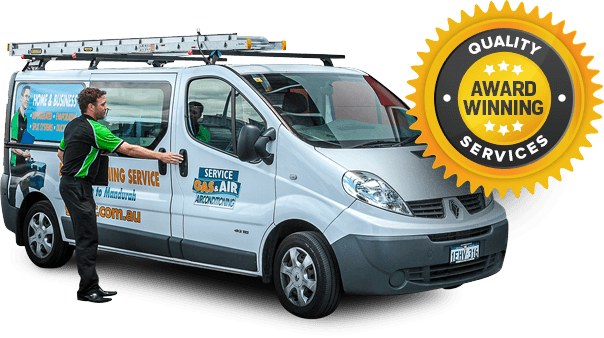 GAS&AIR prides ourselves on providing a high quality service at affordable prices. Our team is standing by to discuss your needs in further detail, and they would be happy to answer any remaining queries you may have.